LIMITED BOOKINGS REMAIN – RESERVE NOW!!! The winter months have provided a bounty rain and the spring harvest is going to be chock-full of delightful treats. This got us to thinkin’…why not do another spring-inspired prix-fixe? SOOOOO…SECURE YOUR RESERVATIONS NOW because the week of APRIL 24th-APRIL 27th (FOUR NIGHTS ONLY) “PRIMAVERA IN ITALIA”will be available at Carpe Vino. This FOUR-COURSE (multiple choices) prix-fixe menu will be “utilizing spring harvest with Italian inspiration” and costs $64.95/person++ (not including tax/gratuity). 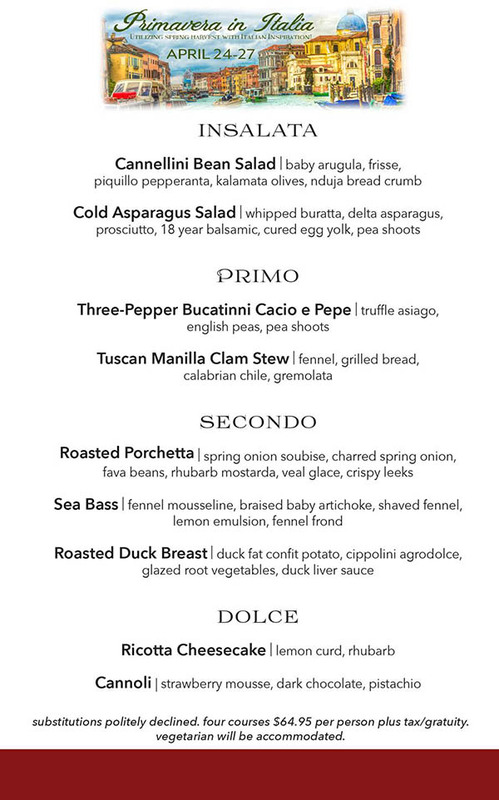 View our full-menu below and click the BOOK A RESERVATION for your table today!